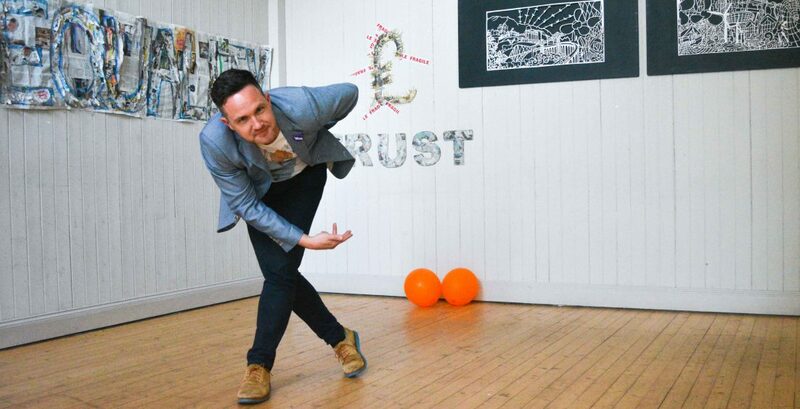 There’s no hint of that, though, in this latest show, put together by Bissett as part of Falkirk’s year-long response to its recent Creative Scotland Creative Place award. For What The F**kirk? – now on tour around community halls in the Falkirk area– emerges as a cross between a documentary and a 55-minute stand-up set, with powerful live music by Adam Stafford, and an attractive solo performance by Bissett as narrator. His theme is the remarkable if little-known, history of Falkirk, and the view of Falkirk taken by local people themselves; and so the show interweaves his jokes and commentary with a series of films featuring clubbers, schoolchildren and senior citizens reflecting on what Falkirk means to them. And the story that emerges, in a highly entertaining evening, is often a moving one. What Bissett argues is that the well-worn stereotype of Falkirk as a hard-drinking, street-fighting town is perhaps better understood as a real willingness of the town’s people to stand up for themselves, and for ordinary folk everywhere. “Touch Ane, Touch Aw”, says the town’s motto; and if Falkirk is now on the move – with the coming of those magical Kelpies – it’s to be hoped that that instinct for solidarity will survive; and produce more work that has something to say to all of us about how to retain a sense of identity and dignity, in a world that would often rob us of both. First performed at Slamannan Community Centre, Falkirk, June 2015. Commissioned by Falkirk Community Trust. Live music by Adam Stafford. Directed by Sacha Kyle.